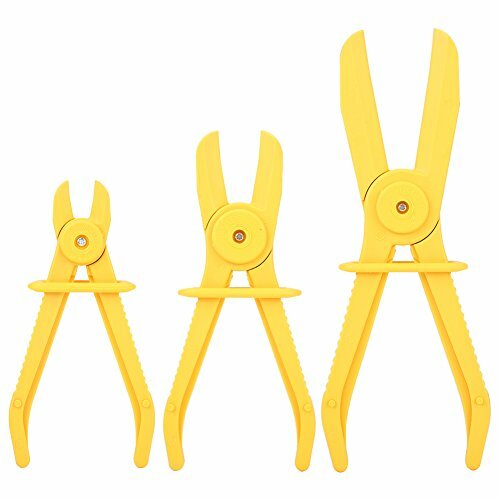 This is a set of 3 pcs pipe clamp set, it is an essential tool for use on flexible hose lines, brakes, fuel, heaters and radiators. It's smooth, rounded jaw edges can effectively prevent damage to internal hose reinforcement, and the non-conductive and high-visibility color also can prevent accidental loss of clamps. The smooth, rounded jaw edges can effectively prevent damage to internal hose reinforcement. High visibility bright color can be easily to find, which can prevent accidental loss of clamps. Great for hose lines, brakes, fuel lines, heaters and radiators clamp. Made from durable plastic, non-conductive, ensure security and durability. Comfortable grip, saving effort. Complete specifications, easy to use.